WASHINGTON, DC––Today, the Senate delayed until after August recess an expected cloture vote to begin debate of CISA, the Cybersecurity Information Sharing Act, a bill that experts say will actually make the U.S. more vulnerable to cyber attacks, while dramatically expanding the government’s unpopular mass surveillance capabilities. Following reports of the delay, Fight for the Future the group responsible for flooding Congress with more than 6 million faxes as part of Operation: #FaxBig Brother, announced they would be turning their viral campaign on large web companies who have been largely silent on the issue despite previous claims that they would fight in Congress for their customers privacy. Corporate offices of Facebook, Google, Yahoo, Dropbox, Microsoft, and other large companies can expect to start receiving a massive volume of faxes in the coming days. Senate leadership had intended to move CISA to a cloture vote this afternoon, but failed to strike a deal as more and more members raised concerns with the bill in the wake of two weeks of intense grassroots action that flooded Senate offices with more than 6.2 million faxes in addition to tens of thousands of emails, phone calls, and tweets. Most of the action came through FaxBigBrother.com a viral web page launched by Fight for the Future with a broad coalition of privacy and civil liberties groups. The campaign spread quickly on social media and was covered by The Guardian, TIME Magazine, CBS News, The Hill, Politico, and NPR’s All Things Considered. The six million faxes were also mentioned several times on the Senate floor by Senator Ron Wyden, a leading opponent of CISA. 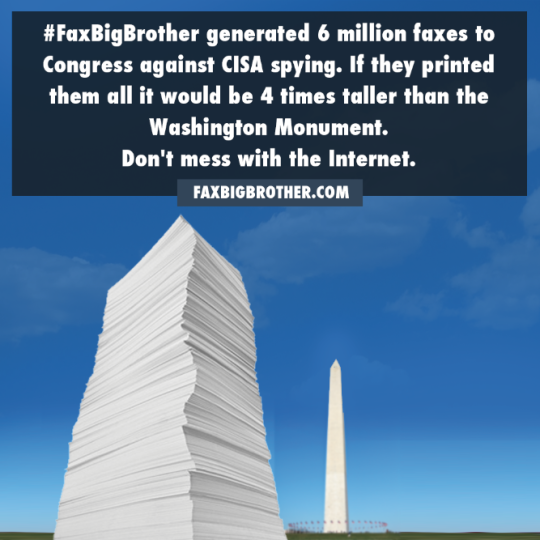 To hammer home the scope of the opposition, Fight for the Future tweeted an image showing that 6 million faxes, if printed out, would stand more than 4 times as tall as the Washington Monument. “Today’s delay is good news, but Internet users are outraged that Congress is even considering this dangerous and unpopular legislation, and even more outraged at the Web companies who stand to benefit financially from CISA’s sweeping legal immunity who have remained silent, putting all of their users’ privacy at risk,” said Evan Greer, Fight for the Future’s campaign director.